I can’t say enough amazing things about this family! First of all, they have been with me since the beginning. 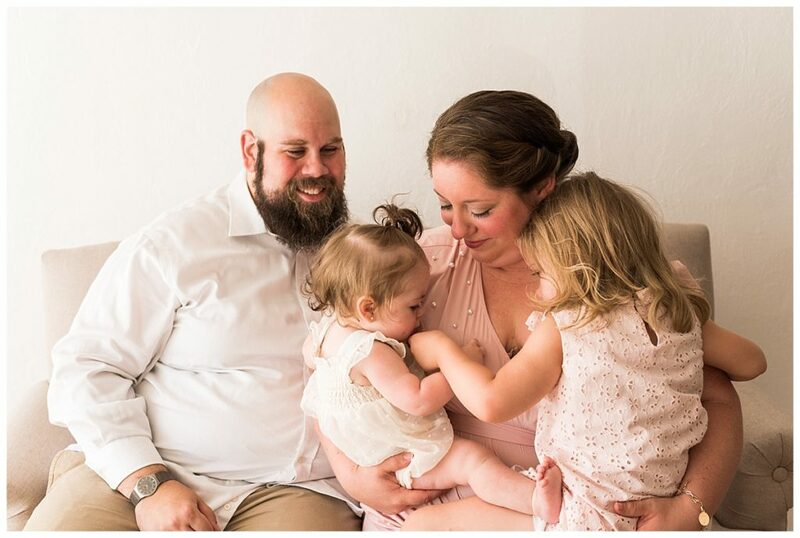 I have had the pleasure of watching their family grow from our first session in their Philadelphia apartment, where I mistakenly arrived at the Drexel University dorms instead of their actual apartment! Now here we are, photographing their second daughter’s first birthday. Seriously, where does the time go? This lifestyle family photo session took place in my Riverton, NJ studio on a hot summer day. They all looked perfect in their whites and pinks! Everyone knows I’m in love with clean and simple! While big sister was warming up to the idea of photos (even though I swear we were best friends at their last session) we took photos of the birthday girl! She did not disappoint and gave me the cutest little expressions. And we can’t forget dad! Still working on warming up for photos so in the meantime, we had some nice family snuggle time. And then dad steps in to save the day! I love getting to see this awesome family every year and sometimes, multiple times a year! Even when we think a session will go badly, it really just ends up being the perfect opportunity for family snuggles! Noreen Turner Photography’s studio is located in historic Riverton, NJ. To book a family photo session with Noreen Turner Photography please inquire here.